To contribute to the comfort and well-being of building occupants by establishing minimum standards for indoor air quality (IAQ). For mechanically ventilated spaces (and for mixed-mode systems when the mechanical ventilation is activated), meet the requirements for both ventilation (option 1 or option 2) and monitoring. Meet the requirements of ASHRAE Standard 62.1–2016, Sections 4, 5, 6.2, 6.5, and 7, or a local equivalent, whichever is more stringent. Projects outside the U.S. may instead meet the requirements of ISO Standard 17772-1:2017, Section 6.3, using Method 1—Perceived air quality with Category I or II and local standard for ventilation system design such as EN Standard 16798-3: 2017, Sections 7-10. Provide outdoor air monitors for all mechanical ventilation systems with outdoor air intake flow greater than 1000 cfm (472 L/s). The monitoring device must be capable of measuring the minimum outdoor air intake flow and be capable of measuring the design minimum outdoor air intake flow with an accuracy of +/–10%. An alarm must indicate when the outdoor airflow value varies by 15% or more from the setpoint. Alternatively, for constant-volume systems that do not employ demand control ventilation, provide an indicator capable of confirming the intake damper is open to the position needed to maintain the design minimum outdoor airflow as determined during the system startup and balancing. For naturally ventilated spaces (and for mixed-mode systems when the mechanical ventilation is inactivated), confirm that natural ventilation is an effective strategy for the project by following the flow diagram in the Chartered Institution of Building Services Engineers (CIBSE) Applications Manual AM10, March 2005, Natural Ventilation in Nondomestic Buildings, Figure 2.8 and meet the requirements for both ventilation (option 1, option 2, or option 3) and monitoring. Meet the requirements of ASHRAE 62.1-2016, Sections 4, 6.4, and 6.5. Meet the requirements of ASHRAE 62.1-2016, Sections 4 and 6.5, and have an engineered natural ventilation system approved by the authority having jurisdiction (per exception 1 of ASHRAE 62.2-2016 section 6.4). This option is available to projects located in a building registered as a local or national historic building. Meet the requirements of ASHRAE 62.1-2016, Sections 4, 6.4.1, 6.4.2, 6.4.3, and 6.5. Comply with at least one of the following strategies. Provide a direct exhaust airflow measurement device capable of measuring the exhaust airflow. This device must measure the exhaust airflow with an accuracy of +/–10% of the design minimum exhaust airflow rate. An alarm must indicate when airflow values vary by 15% or more from the exhaust airflow setpoint. This strategy is not allowed for projects using Ventilation Option 3. Historic building. Provide automatic indication devices on all natural ventilation openings intended to meet the minimum opening requirements. An alarm must indicate when any one of the openings is closed during occupied hours. Monitor carbon dioxide (CO2) concentrations within each thermal zone. CO2 monitors must be between 3 and 6 feet (900 and 1 800 millimeters) above the floor and within the thermal zone. CO2 monitors must have an audible or visual indicator or alert the building automation system if the sensed CO2 concentration exceeds the setpoint by more than 10%. Calculate appropriate CO2 setpoints using the methods in ASHRAE 62.1–2016, Appendix D.
The indoor air quality procedure defined in ASHRAE Standard 62.1–2016, Section 6.3 may not be used to comply with this prerequisite. Mechanical ventilation systems installed during core and shell construction must be capable of meeting projected ventilation levels and monitoring based on the requirements of anticipated future tenants. 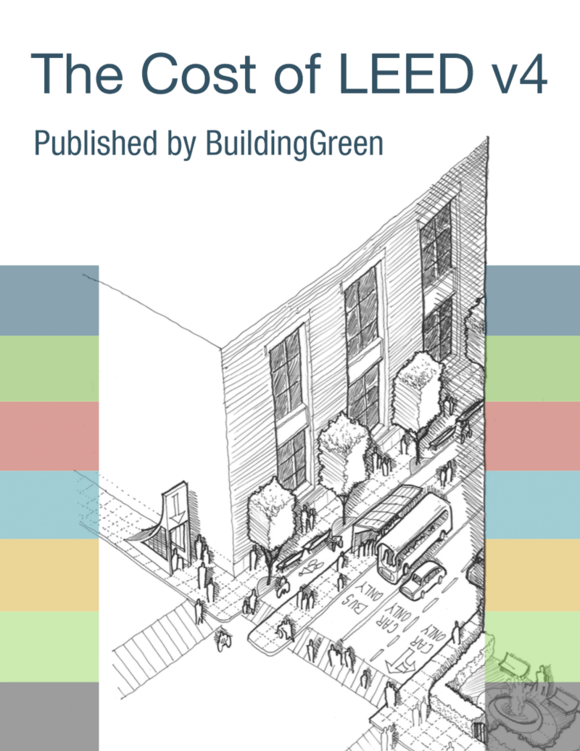 In addition to the requirements above, if the project building contains residential units, each dwelling unit must meet the requirements of LEED v4.1 Multifamily EQ Prerequisite Combustion venting and EQ Prerequisite Radon-resistant construction.